It’s the most wonderful time of the year! Can’t believe Christmas is right around the corner. Is it just me or has time flown by!?? Next thing we know it’s Summer all over again but I’m not complaining! Christmas is my all time favourite holiday but really isn’t it everyone’s? If I had it my way decorations and tree would be up and Christmas music would be playing by November 1st! But now I wait at least until Shayne’s birthday is over to put up the decorations. With the new addition to the family (you can read all about him here) I’m a little hesitate to put up a real tree this year as he will try and eat the pines, chew on the bark and drink the water lol! Every year I’m always scrambling around to find the perfect gifts for everyone in my family. I always want to purchase something they actually need and something that’s fun! So I have put together the perfect gift guide for those family members you’re never to sure on what to get them! Yeti Tumbler: I LOVE these mugs. They are so awesome for the whole family. They keep your drink hot or cold for hours on end. Stick a Starbucks gift card inside and you got yourself one perfect little gift! Great for secret Santa too! Throw: I don’t know about you but if someone gave me a throw I’d be jumping over the moon! I believe you can never have too many throws in one household. Getting all comfy and cozy while watching a movie is what life’s all about lol! Furbo: Are you worried about leaving your four-legged family member alone all day? Going away on vacation and want to see how they’re doing? Furbo lets you do all of these things just by a click of a button on your phone. You can talk, feed them treats, and also has night vision! Gift Basket: I love this idea! There is this Canadian company based in Toronto called Present Day that creates different gift baskets or you can customize your very own. If you’re on a budget, create one yourself with some of their favourite items and put it in a cute basket! PerkiePrints: Turning your photos into personal prints. This is something that can be SO personalized and sentimental. Love they give you so many options to choose from and how reasonable it is! Diffuser/Essential Oils: This gift is a no brainer. If you never know what to get your aunt, cousin, mom or in-laws. Any stone diffuser from Saje is one I always seem to grab. I think it goes really well in anyone’s home! Games: What better way to get everyone together and having a lot of laughs than playing games! Cards Against Humanity, What Do you Meme and LRC dice game are just a few that my whole family loves. 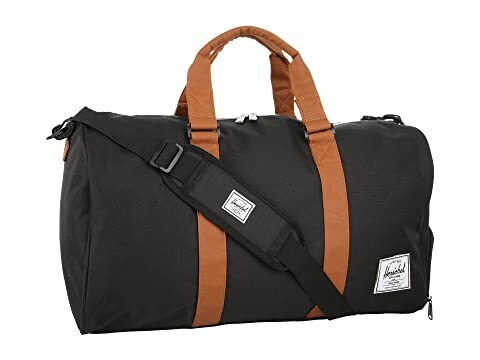 Travel Bag: Even if you aren’t a huge traveler I think A Herschel duffel bag is great for everyone! Perfect for road trips, overnights, camping. You can easily pack a weeks worth of clothing! So spacious yet you aren’t carrying a ginormous bag. Create Your Own Story: There are so many companies out there that has you creating your own story book. One anniversary I made Shayne a book from lovebook It was such a fun process! Also it was very reasonable, quick and fast delivery!